Few Governors have carried squealing pigs into a state capitol. Gov. Mark Sanford is one of the few -- perhaps the only one -- ever to do so. Sanford is no "hick from the sticks" but a savvy, budget-conscious Chief Executive. His fight to reform his State's own budgeting process by instilling more oversight and accountability is a reminder to us in Washington that we have our own work to do on the Federal level to bring runaway spending under control. South Carolina's government lacks sensible spending controls. One glaring shortcoming is the manner in which money is appropriated to state agencies. The money is not allocated by program, making it difficult to discern how the money is being spent. Furthermore, Gov. Sanford has experienced difficulty in spearheading reform because a single dissenting vote in the State Senate can kill legislation. Former South Carolina Governors who represented the good old boy network were able to accommodate themselves to this unusual feature of the State's political system. Sanford is a maverick who is unwilling to play by the establishment's rules; he is demonstrating the same willingness to fight to change the system in his State that he did in Washington when he served in Congress. Sanford was a member of the Class of 1994 revolutionaries who came to Washington committed to reducing government spending, cutting taxes and curbing excessive Federal power. Plenty of politicians over the years have presented themselves as being tight-fisted when it comes to spending your money. For many it is more chatter than true commitment. Not so with Sanford. During his six years in Congress, he returned $1.5 million from his office budget to the U.S. Treasury. Citizens Against Government Waste awarded him its "Taxpayer Superhero Award" each of the three terms he served in Congress. Many politicians jumped on the term limits bandwagon only to conveniently forget their pledge after finding political power to their liking. Sanford actually honored his pledge, staying true to his promise to serve only three terms. 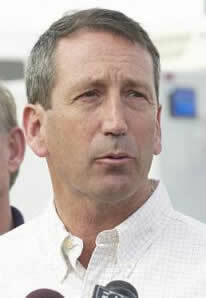 Rather than seek reelection in 2000, Sanford went home. However, he retained his interest in public service, running for Governor the next year, defeating the scandal-tainted incumbent. The inauguration was not a top-hat-and-tails affair, which only South Carolina's swells could have afforded to attend; in keeping with Sanford's populist instincts, the event was affordable for the average citizen. Plus the transition under Sanford cost South Carolinians half of what it had cost four years before. Sanford's predecessor, Jim Hodges, fought to maintain the status quo when the State's budget experienced a budget crunch similar to those experienced by other states in the early part of this decade. When the South Carolina Legislature is out of session, as it is for six months each year, power over the State budget is delegated to a Budget Control Board, whose membership is comprised of the Governor, the Chairman of the House Ways & Means Committee, the Chairman of the Senate Finance Committee, the State Treasurer and the State Comptroller General. Time after time, before and after the 2002 election, Hodges failed to take the needed steps to bring State spending under control. Writing in The State on November 1, 2002, editorial page editor Brad Warthen charged that Hodges "[w]hen given the choice between doing a responsible, but risky, thing for the good of the state and a less responsible thing that would help him get re-elected, he has repeatedly chosen the latter." Warthen recalled at the start of the year Hodges decided to avoid calling for "politically painful budget cuts" and then upbraided the Legislature for trying to fulfill its constitutional responsibility by passing a balanced budget. Even after the election Hodges failed to show the resolve to arrest the State's budget problems. The State had managed to run up a $155 million deficit. Fortunately, a new Governor with a different philosophy had been chosen by South Carolina voters to lead the State. Sanford explains his mission this way: "It's all about protecting the taxpayers of South Carolina from politically-driven, pork barrel spending." Sanford is willing to use his bully pulpit to press the case for greater fiscal accountability and restraint. "We're going to continue to challenge the status quo wherever possible so that government learns to live within its means the way families and small businesses do," he asserted in June 2004 when signing the "Fiscal Discipline Act of 2004" into law. This piece of legislation limits State spending from the General Fund over the next four years to ensure funds borrowed from the General Reserve Fund will be restored by Fiscal Year 2008-2009. That only begins to underscore the changes that Sanford is trying to bring to South Carolina. He issued over 100 vetoes in the spring of 2004 and, in a situation that will be familiar to observers of Capitol Hill, many Republicans in the House chose politics over the principle of fiscal integrity by voting in support of overrides. However, Sanford was able to force some significant changes. He was able to divert money from the State Education Department, directing that the money be sent to the classroom. He has worked with the Reason Foundation to examine ways to privatize State functions or to conduct them on a more businesslike basis. South Carolina operates a statewide school bus fleet. Sanford has determined that privatizing the service would save $250 million over ten years. Over 30 institutions of higher learning receive assistance from the State including Clemson, the Citadel and Coastal Carolina University. Sanford also wants to encourage public universities to privatize. Sanford contends scarce dollars are being spent trying to support too many institutions. He argues the State needs to take a "coordinated" approach to higher education and that the lack of it has led to higher tuition costs. "We're currently at 105% the national average in tuition costs while North Carolina is at 82% and Georgia is at 86%. A big part of that is that the sheer number of schools we're trying to support," he explained. Another problem he experiences will be very familiar to those who watch the earmarks made for pork barrel spending on Capitol Hill simply to sate the wishes of powerful legislators. The same thing happens in South Carolina with legislators using their power to fund purchases for items such as a fire engines, motorboats and baseball fields that are not specifically mentioned in the State Budget. The money is appropriated by the Legislature on a non-competitive basis. Sanford issued an executive order in September 2004 to prevent such pass-throughs unless the agency director certifies the grant would "further the goals and purposes of the agency." Sanford and I do not see eye-to-eye on everything. One area of disagreement involves Senator John McCain. Sanford supported his 2000 Presidential bid. My disagreements with Senator McCain are well known. However, I find myself concurring with Ed McMullen, a former Free Congress Foundation employee who now directs the South Carolina Policy Council, about Sanford: Sanford is one who "truly gets it. [Sanford] understands that limited government is an objective." Sanford's 2005-2006 Executive Budget, unveiled on January 5th, proposes over $162 million in specific savings. Hearings open to the public were used to prepare the budget and to solicit ideas for savings. The budget attempts to rank government activities in order of priority. "This was a never-before-attempted process in our state that we believe led to some tangible, measurable benefits in terms of the budget we've laid out. We were able to devote more resources to core government functions like education and public safety, take some critical steps toward getting our state's fiscal house in order and cut a lot of the wasteful spending out in the process," Sanford explained. The experience of South Carolina demonstrates the need for assuring that the political process encourages accountability, oversight and efficiency in use of our tax money. Left unchecked politicians will abandon their responsibility to the public and embrace the politics of convenience. Sanford's willingness to press the case for far-reaching and effective reforms should be welcomed by concerned citizens everywhere who care about fiscal integrity. Sanford's intensity of commitment to instilling more oversight and accountability in spending is certainly needed in Washington. Some legislators in Congress do share it. More need it. This fall Congress jammed nine appropriations bills into an omnibus bill with a $388 billion price tag. Legislators managed to stick pork barrel projects such as $200,000 for pedestrian linkages for Montgomery County, Maryland, one of the most affluent counties in our country. There was also the $80,000 for the San Diego Gay, Lesbian, Bisexual and Transgender Community Center and $75,000 for the Paper Industry International Hall of Fame in Appleton, Wisconsin. There were many more outrages too numerous to mention. I'll spare you the details to keep your blood pressure under control. We need to reprioritize our spending, not continue dishing out money on programs that are duplicative, obsolete or just plain wasteful. A smart start to encourage more sensible spending by the Federal Government would be to create a commission to review federal spending patterned after the blue-ribbon commission that determined which military bases should be closed as the Cold War ended. That commission was successful in persuading legislators to close costly, unneeded facilities. Senator Sam Brownback (R-KS) and Rep. Todd Tiahrt (R-KS) authored legislation to create the Commission on the Accountability and Review of Federal Agencies "CARFA" (S.837/H.R. 3123), which would seek out wasteful programs. The CARFA commission would issue recommendations to Congress which would be given an up-or-down vote. All programs would stay, or they would all go. Period. CARFA failed to obtain consideration in the 108th Congress. However, the public is starting to wake up to the true cost of runaway spending; expect a renewed push for Congress to consider CARFA in this session. South Carolina is only one State in the Union but its experience demonstrates the need for continued commitment, even the willingness to challenge the status quo. CARFA is a necessary first step to creating greater accountability in spending. If South Carolina can come to grips with its spending problem, then eventually Washington can, too. It had better. Otherwise we will all be the losers if deficits turn into large-scale public debt that drains our economic strength through expensive interest payments. Frankly, that's a situation we can ill afford. That's why I'll be cheering Sanford as he continues his fight on behalf of sensible budgeting and spending in South Carolina. I hope more people in Washington DC will profit from his example.